A variety of sizes to get the right fit for the job. Flexible rental periods that let you work at your own pace. All inclusive, flat-rate pricing so you know the full cost upfront. If you’re looking for ongoing waste service for your business, we also offer front load dumpsters for regular garbage collection. Choose your project below as the first step to setting up the right temporary dumpster rental for the job. Don't see what you're working on? Give us a call at 844-444-3867 – chances are we have a container that’s up to the task. 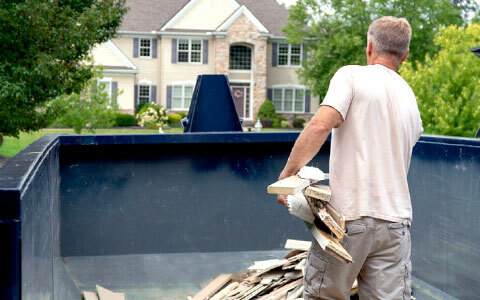 Ordering a dumpster is a simple way to get rid of unwanted household items, furniture and other debris at your own pace. Our temporary dumpster rentals help contractors, construction workers and DIYers keep your work area clean and your project on track. Whether you’re handling your own kitchen remodel or doing work for a client, our residential dumpsters make cleanup quick and easy. These temporary dumpsters can handle even the heaviest materials. It’s not just concrete: they also hold asphalt, brick, block and masonry. We’ll get a dumpster—or several—to your job site or property fast to help you clean up and keep the demolition work rolling. These short-term dumpster rentals are a convenient way to get rid of heavy tiles and shingles. We deliver fast to roofers all over the country. Digging a foundation or other excavation project as part your construction job? In the section below, we’ve also got dumpsters to haul away dirt. Not sure which size is right for your project? Check out our dumpster weight calculators. When you’re making way for a new patio or refreshing a client’s landscaping, we’ve got a temporary dumpster rental for all the debris. From grading a lawn to digging a garden, renting a dirt dumpster is the easiest way to get rid of the leftover soil from your project. Getting rid of a patio or walkway as part of your landscaping project? In the section above, we have dumpsters for concrete and other heavy debris. Whether you're organizing a 5k race, a music festival, a community cleanup or a major family reunion, we have containers for any size crowd. What Does a Temporary Dumpster Rental Cost? A temporary dumpster rental costs between $377.45 and $544.73 on average. But keep in mind that the exact price depends on several factors, including the size you choose and the type of debris you’re throwing away. The biggest factor that affects the cost of your container is your location. Can You Rent a Dumpster for Just One Day? All of our temporary dumpsters come with a multi-day rental period so you can work at a comfortable pace or deal with unexpected slow-downs in your project without raising the price. But if you only need a one-day dumpster rental, you can call for pickup anytime during your rental period. Filled Up Your Dumpster Before You're Done? We know that when you’re working on a major project, you may end up with more debris than your container can hold. With a quick call, you can set up ongoing service for your temporary dumpster rental to keep your project rolling. We’ll empty your container quickly, then return it so you can get back to work.